Three years ago, junior Aaron Karas signed up for a bone marrow registry. Last month, he got the chance to help save the life of a man he may never meet. Emory Photo/Video. 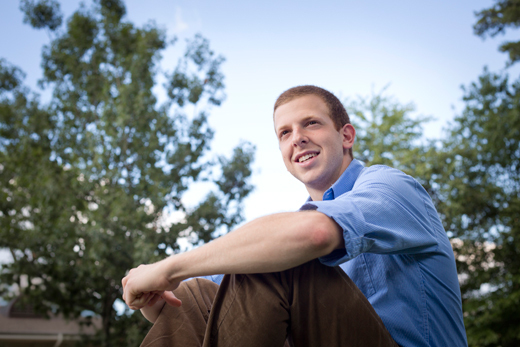 When Emory junior Aaron Karas asked to miss class in late September, his professors weren't expecting the reason why. While it could accurately be said that Karas had a doctor's appointment, he wasn't ill. Instead, he was scheduled to spend hours at Emory's Winship Cancer Institute donating bone marrow stem cells to a complete stranger — someone Karas may never meet, but who will get a new chance at life based on his generosity. "I was impressed," says Astrid M. Eckert, associate professor and director of undergraduate studies in Emory's history department, who teaches Karas in History 218: Nazi Germany, with Sander Gilman, a professor in the Institute for Liberal Arts. "While I had been aware that such efforts exist, I had never met someone who actually did it. He asked whether I would consider his absence for this reason an excused one, and I obviously did." Karas, 21, is a premed student from Newton, Massachusetts, majoring in biology with a minor in history. He isn't new to volunteerism — prior to coming to Emory, he took a gap year to spend nine months volunteering and studying in Israel. He currently serves as president of Emory Students for Israel; he's also a member of the Student Programming Council, an Orientation leader and a new Wonderful Wednesday moderator. But his donation takes giving to a new level, even on a campus known for community service. "To have someone like Aaron donate bone marrow to a perfect stranger is a great opportunity to educate others (including myself) about the issue: how did he get matched up, what does it mean to the person receiving it, how did the actual procedure work," Eckert notes. "His example could help others decide whether becoming a donor is the right decision for them." For Karas, the decision to donate was both a "no brainer" and something akin to a family tradition. Eight years ago, his father donated for a baby boy with a rare bone disease who reminded him of his own three sons. Last month, Karas donated for a man who could be his father. His father's donation led to relationships that continue to impact and inspire his whole family. Regulations allow the donor and recipient to exchange anonymous messages for the first year following transplantation; afterwards, if both parties consent and live in countries where medical policies allow identities to be disclosed, they can identify themselves and even meet. "A year later my dad got in touch with [the boy's] parents; they talked over email and phone and decided to come visit us. They lived in New York, but it turns out they had cousins in Newton, five minutes away from us," Karas recalls. "That little boy is now a totally healthy nine-year-old. He's an incredible kid, and we still get together and are close with his family." While his father went on to organize several bone marrow registration drives across Boston, at first Karas couldn't participate — donors have to be 18 to register. When Karas reached that milestone, he signed up at a drive on Senior Night at his high school. Three and a half years later, his phone rang. "They said I was a match with a 62-year-old man with acute myelogenous leukemia," remembers Karas, who was working as sports director at a summer camp in Hendersonville, N.C., this summer when he answered the call. Was Karas still willing to be a donor? 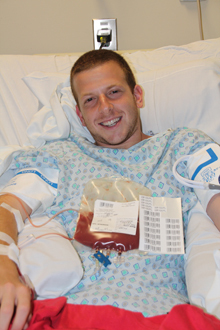 Aaron Karas donated stem cells Sept. 22 in a procedure at Emory’s Winship Cancer Institute. Photo courtesy Aaron Karas. Bone marrow or stem cell transplants can be used to treat bone marrow disorders such as leukemia, lymphoma, myelodysplastic syndrome, immune deficiency and other blood diseases, according to Amelia Langston, medical director of Emory Bone Marrow and Stem Cell Transplant Center at Winship Cancer Institute. "Transplantation offers the possibility of cure for patients with blood/marrow disorders that cannot be cured with standard chemotherapy," Langston explains. "When we do a transplant, we are destroying the diseased marrow of the patient, and replacing it with the stem cells from a normal donor. It is very much like replanting seeds of a garden. "In addition to providing normal fresh seeds, the donor immune system is also transferred, and this provides additional effects in eliminating the last few malignant cells through what we term a 'graft vs. leukemia' or 'graft vs. disease effect,'" she says. Matching is more complicated than simply having the same blood type, highlighting the importance of having a broad, diverse pool of potential donors. "There are millions of potential variations in the typing — called HLA — that determines compatibility between donor and recipient," Langston says. "In order to have a reasonable likelihood of finding a donor for most patients who need a transplant, we need millions of donors in the registry." Registering as a donor simply requires filling out health forms and providing either a cheek swab or a blood sample. Donor information is kept in a database where it can be matched with patients in need of transplantation. If a potential donor-patient match is identified, the donor will be contacted to see if he or she is still willing; if so, the donor will undergo further medical tests including an EKG, chest X-ray and additional blood work. There are then two ways to donate, based on what doctors believe is best for the particular patient. Bone marrow donation, done in an operating room under anesthesia, involves extracting bone marrow from the donor's hip bones. Peripheral blood stem cell donation requires the donor to take growth factor shots for several days so that stem cells will circulate in the bloodstream; two IVs are then inserted so the donor's blood can be filtered through an apheresis machine that extracts stem cells for donation. For either procedure, most donors do not need to stay in the hospital overnight. "How important it is to be willing to help"
Karas registered using a cheek swap through Gift of Life Bone Marrow Foundation, an associate donor registry of the National Marrow Donor Program. His brothers have also registered as donors, a fact that makes their father, Steven Karas, "exceedingly proud." "My wife, Lynne, and I are thrilled to know that each of our sons has grown up with an understanding of what it means to be a part of a community and how important it is to be willing to help when you are needed," Steven Karas says. Aaron Karas was asked to donate peripheral blood stem cells, and his father admits he was a bit concerned about the timing of the donation: "Initially the folks coordinating Aaron's donation wanted him to travel to Virginia to donate," he says. "Our concern was about him needing to miss five days of classes during the first month of his junior year." Luckily, it was arranged for him to donate at Emory's Winship Cancer Institute to minimize the time he would miss class. "I was definitely worried about the time commitment, but it helped that I didn't have to fly somewhere," Aaron Karas says. On Sept. 18, he began receiving twice-daily injections to help his body develop more stem cells and push them out of his bones into his blood. On the fifth day, Sept. 22, he spent the day at Winship to donate the cells that could give the recipient a better chance at survival. "I went in at 7 in the morning and for five hours, I was hooked up to a machine," Karas says. "My blood went out through one of my arms, through a machine, and then returned to my other arm. They ran all of my blood through the machine four times, which is kind of cool." His parents came to be with him during the donation. "It's never fun to see your child in any type of discomfort," his father says. "But in this case, Lynne and I knew that it was temporary, and that, on balance, a few days of discomfort was exponentially out-weighed by the prospect of saving someone's life." His son describes the feeling as uncomfortable, not painful, and says that his main symptom in the days leading up to the donation was fatigue — "Your cells are pushing out of your bones, so I felt kind of achy, like an old man." Nothing he experienced should be a deterrent to donation, Karas stresses. "My takeaway message from this was that a little discomfort that I was caused was totally worth it to potentially and hopefully save this man's life," he says. In all, Karas missed two days of classes. These days, he's "pretty much back to normal" — but with a message for his recipient and a mission to encourage others to register to donate. "Seeing the incredible relationship that my dad and I and the rest of my family have with the boy he donated to and his parents, I definitely want to meet [my recipient]," Karas says. "I would want to know he is OK. I would want him to know I am thinking about him and I would want to know what his experience has been like." Beyond their matching HLA type, Karas cites another tie to the man who received his stem cells: "Two years ago, my aunt — my dad's sister — died from the same disease this man has," he says. "She had a stem cell donation which obviously didn't work, but I remember the hope my family had when we found out she had a match. That hope is unparalleled." Now Karas wants to inspire more people to offer that hope to others in need, as he reflects on visiting the infusion center at Winship to receive shots in the days leading up to his donation. "Basically everyone else there was going through chemotherapy," Karas says. "The whole thing made me realize, as cheesy as it sounds, how lucky I am and how lucky most people I know are. It is so easy for everyone to register, and someone could register and end up being a match for one of those people I saw sitting there. "That is kind of incredible."